How to Easily Solve PS4 Won't Play MP4 Files? Why PS4 won't see some MP4 files? Why can't I watch MP4 files on my PS4? 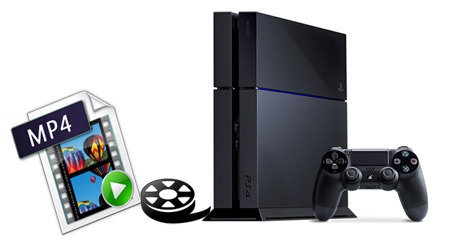 The PS4's Media Player claims that it allows for playback of MP4 movies over both wi-fi (DLNA) and USB. However, in some cases, you'll find your MP4 files can be played on PS4. The reason is that different MP4 files are encoded with different audio and video codecs. According to PlayStation support website, PS4 only supports playing MP4 files encoded with H.264/MPEG-4 AVC High Profile (AAC LC). If the MP4 video is not encoded with PS4 compatible codec, we will fail to stream MP4 to PS4 or cannot play MP4 on PS4 even if successfully transferred MP4 to PlayStation4. So does the PS3. To solve PS4 won't play MP4 problem, the easy and quick workaround is to encode/re-encode MP4 to PS4 compatible H.264 or MPEG-4 encoded MP4 files. Along with some help from third-party program like EaseFab Video Converter (available for Windows and Mac), you can achieve your goal effortlessly. This software can do batch conversion from MP4, MKV, MOV, VOB and more to PS4 supported video formats with fast encoding speed and excellent output video quality. Also, even if you don't know anything about video codec and audio codec, there is no need to worry because this software has optimized presets for PS4. To load a MP4 file to this PS4 video converter, you can either click the Add Files button in the top-left hand corner of this interface or directly drag it from your computer to this program's left pane. If you have several MP4 files, batch import can save you more time. Click "Profile" and find "Game Hardware" category. As you see, this program provides optimized presets for PS3 and PSP. So in this step, you can just choose the ready PS3 or PS3 HD preset for PS4 as the output format, which will remove all the incompatibility issue when playing MP4 movies on PS4. Tip: If the default video/parameters can't meet your needs, just click Settings icon to adjust the video codec, bitrate, frame rate, audio sample rate, etc to get a decent video as you want. In principle, the larger input values, the better output quality, but the corresponding larger file size. Pressing the "Convert" button, the program begins to Convert MP4 to PS4 immediately. See, it is so easy to achieve your goal. Why not take an action now! Once you own the program, you can make it. > Resource > Video Tips > MP4 Topics > Why PS4 won't see some MP4 files?